Gifts from the Pirates: "time is what we want most,but what we use worst"
For the first time in a long time i'm bored, it really doesn't happen very often but ive found myself wondering what to do. Tv isn't an option unless im watching a DVD (although i was laughed at a few nights back when Mrs M walked in the lounge and saw me watching the x-men cartoon....alone! apparently i'm "cute"). i was going to be very grown up and read some comic's but my iPad is dead. Got me thinking of other times ive been bored and had to find some way of killing time, it brought me to this picture from a few years back. 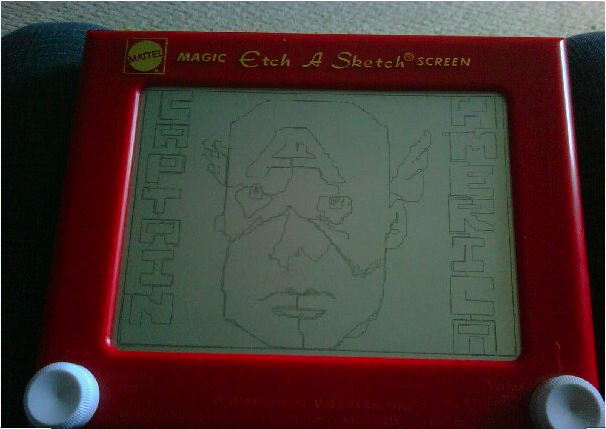 I found myself in a house waiting for Mrs M, I looked down and there was an Etch A Sketch. (well it would have been rude not to). I really should invest in on for the house, its like a poor mans photoshop. Knowing my usual obsessive behavior ill probably be thinking Etch A Sketch all night now and ill end up buying one tomorrow. Oops!! For anyone out there who is as obsessive a collector as myself, i have found that recently much of my spare minutes have been taken up by http://www.virtualtoychest.com/, This site is great if you are trying to track down the toys that make up your collections. Their not on the site to buy but im useless at remembering characters names in my old age so this site does it for me.